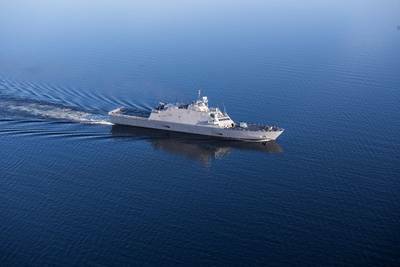 One of the U.S. Navy’s newest Freedom variant littoral combat ships (LCS) completed its final significant milestone before its scheduled summer delivery with the conclusion of acceptance trials at the end of May. On May 25, the future USS Sioux City (LCS 11) wrapped up a series of graded in-port and underway demonstrations on the Great Lakes for the Navy's Board of Inspection and Survey. During the trial, the Navy conducted comprehensive tests intended to demonstrate the performance of the propulsion plant, ship handling and auxiliary systems. "The successful completion of this acceptance trial is an important step in the life of the future USS Sioux City," said LCS program manager Capt. Mike Taylor. "I look forward to the next phase of Sioux City's journey when she is delivered to the Navy this summer." Following delivery and commissioning in Annapolis, Md., LCS-11 will sail to Florida to be homeported in Mayport with sister ships USS Milwaukee (LCS 5), USS Detroit (LCS 7) and USS Little Rock (LCS 9). 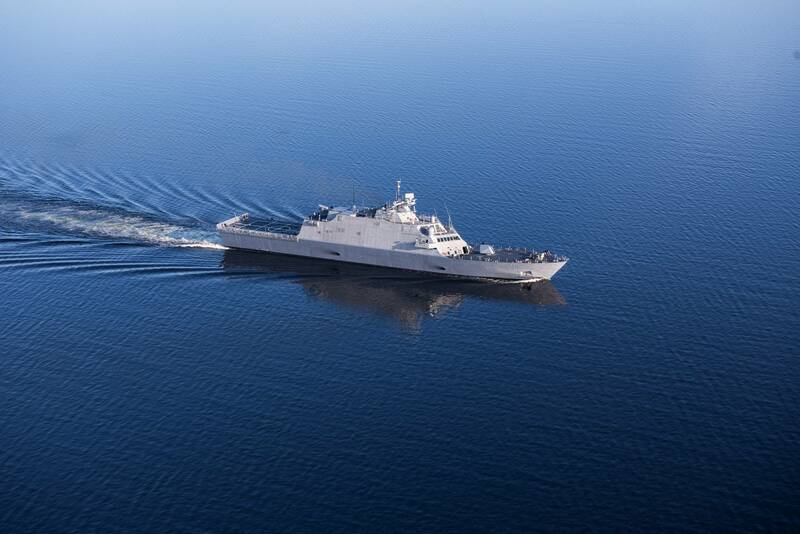 The LCS class consists of two variants: the Freedom variant and the Independence variant, designed and built by two separate industry teams. The Freedom variant team is led by Lockheed Martin (for the odd-numbered hulls, e.g. LCS 1). It is a steel monohull design constructed by Lockheed Martin in the Fincantieri Marinette Marine Corporation's shipyard in Marinette, Wis. The Independence variant is an aluminum trimaran design originally built by an industry team led by General Dynamics Bath Iron Works for LCS 2 and LCS 4. Currently, Independence variant LCS (LCS 6 and subsequent even-numbered hulls) are constructed by Austal USA in the company's Mobile, Ala. shipyard. 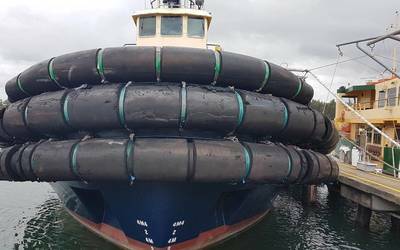 Following the the future USS Sioux City, eight more Freedom variant ships are under construction at Fincantieri Marinette Marine Corp. in Marinette. Wichita (LCS 13) was christened in September 2016 and completed builder's trials earlier this year and will conduct acceptance trials in July. Meanwhile, Billings (LCS 15) was christened in 2017 and sister ship Indianapolis (LCS 17) was christened in April 2018. Additional ships in the production phase include St. Louis (LCS 19), Minneapolis-Saint Paul (LCS 21) and Cooperstown (LCS 23), with Marinette (LCS 25) and Nantucket (LCS 27) in the preproduction phases.